Ever since my mother-in-law shared her Cathedral Windows Recipe with me, it’s been one of my favorite things to make at Easter and Christmas. It’s such an easy recipe and turns out so pretty! One of the great bonuses that came with marrying my husband was that my immediate family expanded exponentially immediately and with them came years of traditions and time-tested recipes. For those of you who are regular readers, you might assume I am being my typical sarcastic self, but I assure you I am entirely sincere on this matter. My mother prides herself on being a professional, working woman and she is one of the hardest working women I know. However, she had no proclivity for anything remotely domestic so I grew up believing frozen dinners and grilled cheese sandwiches were gourmet meals. And I honestly didn’t know you could make mashed potatoes from actual potatoes until my mother-in-law introduced me to the technique that did not involve adding water and butter to potato buds from a box. So, along with a newly expanded family (my husband is one of 14 children), came decades of holiday traditions, many of them involving favorite family recipes. They make a variety of delicious recipes and sweet treats at Christmas, one of which were these Cathedral Windows, which I found both beautiful and delicious. The problem with making Cathedral Windows at Christmas is that it is VERY difficult to find the colored marshmallows at Christmas. 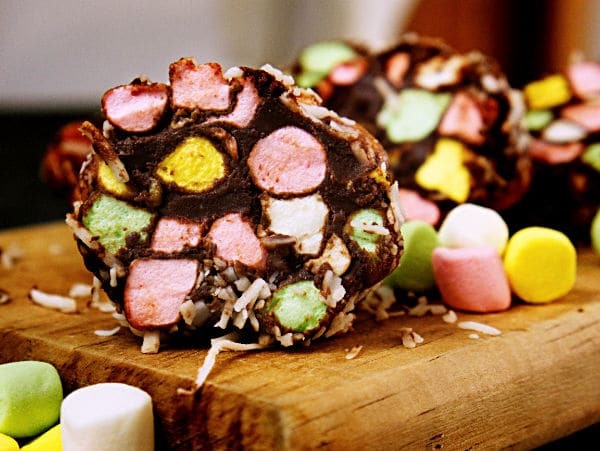 The colored marshmallows are essential since the whole point is to make the cookies look like stained glass windows. No, the time to buy pastel colored marshmallows is during the Easter season. 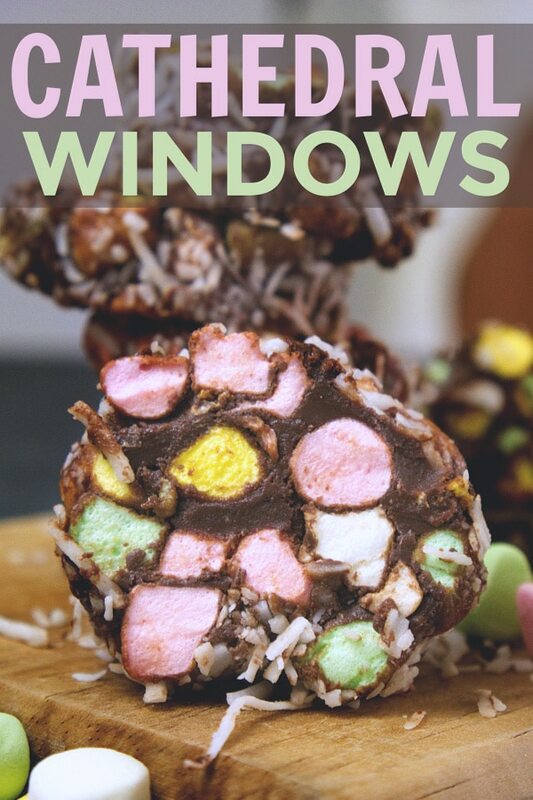 And since Easter is the other time of year (other than Christmas) when most people attend church, this Cathedral Windows recipe is as appropriate as an Easter recipe. The great thing about this recipe is that it only calls for 4 ingredients. Actually, the family recipe also includes chopped nuts, but my kids prefer it without them. First, place chocolate chips and butter in a saucepan or in a microwaveable bowl. My mother-in-law does the saucepan method. I use the microwave. 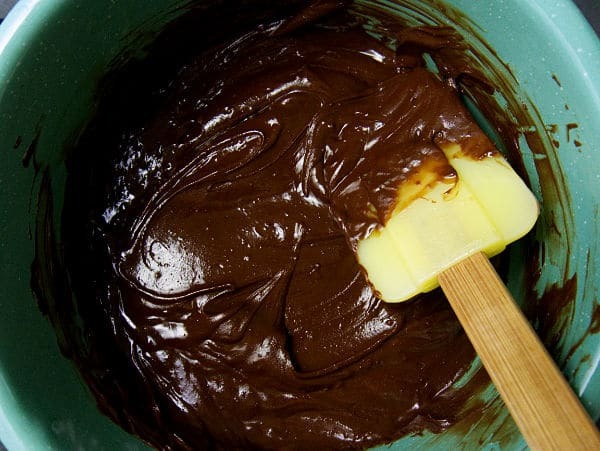 Melt (stirring frequently) until all the chocolate and butter is melted and the mixture has a smooth consistency. 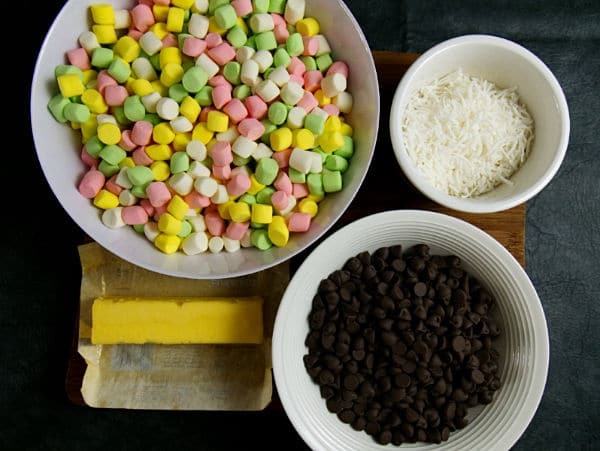 Next, place colored marshmallows in a large bowl. Gently fold in the chocolate mixture. 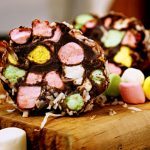 Fold chocolate into marshmallows and stir well until all marshmallows are coated in chocolate. 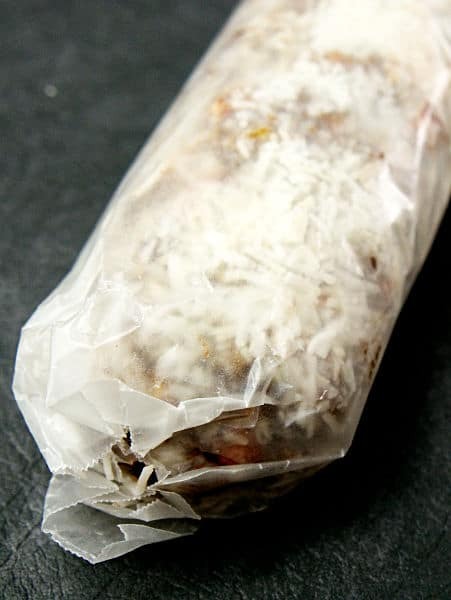 Lay out a piece of wax paper and sprinkle coconut in a long, wide strip down the center of the wax paper. 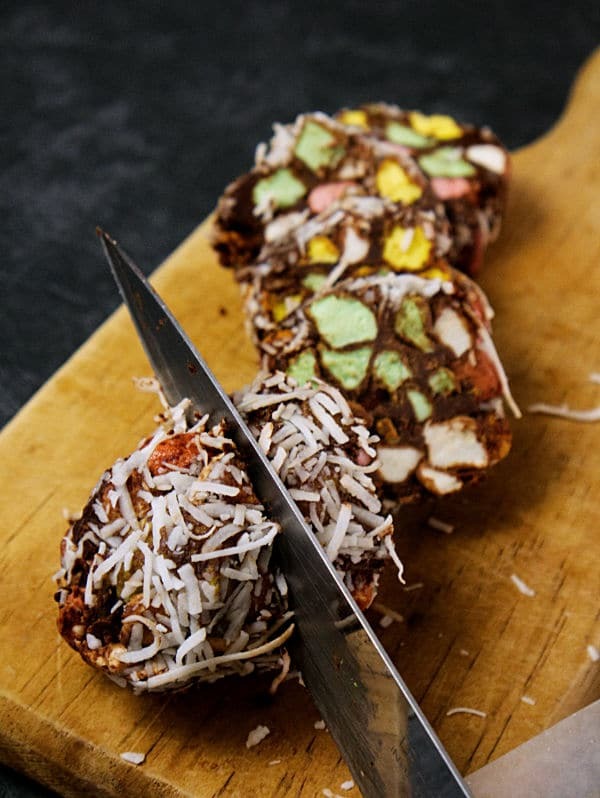 Form a log out of the chocolate marshmallow mixture and lay it directly onto the strip of coconut. Gently roll the log back and forth to coat sides in coconut. 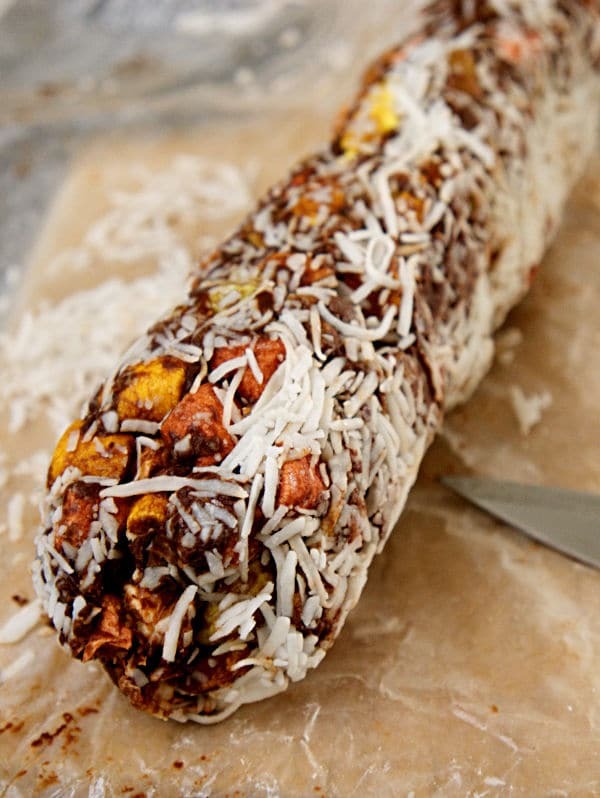 Sprinkle additional coconut along the top of the log. Roll tightly in the wax paper. When ready, unroll and cut the log into 1/2 inch slices. Now you can see the Cathedral Window effect. 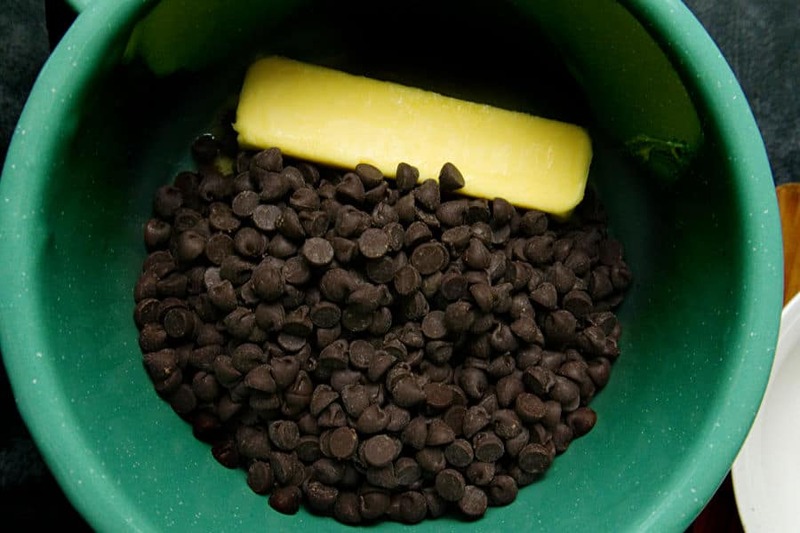 Melt chocolate chips and butter over low heat or in microwave. Place marshmallows (and nuts, if desired) in a large bowl. 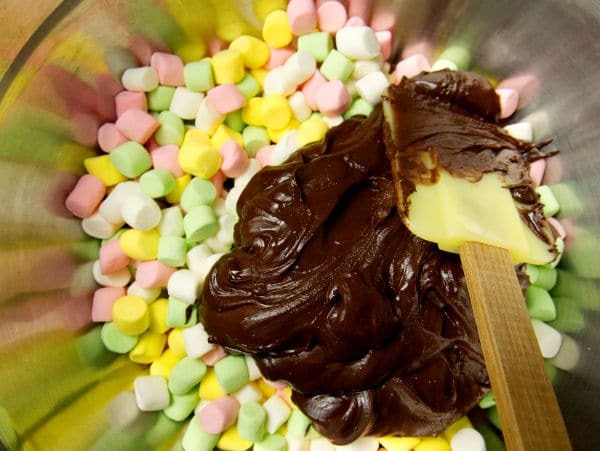 Fold chocolate mixture into marshmallows until all marshmallows are coated. Lay out a strip of wax paper. 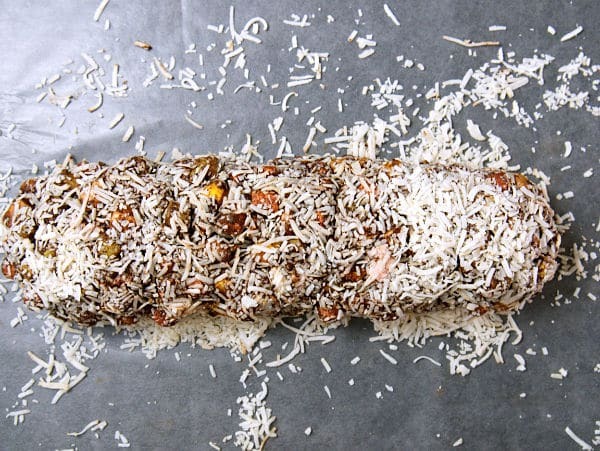 Sprinkle coconut (if desired) in a long, wide strip down the length of the wax paper. 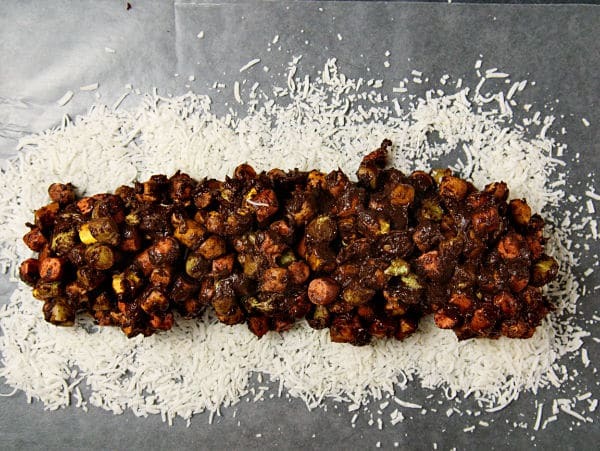 Shape chocolate marshmallow mixture into a log and lay on top of the coconut strip (or down the center of the wax paper if you don't use the coconut). Roll back and forth to coat in coconut and sprinkle additional coconut on top. Wrap wax paper tightly around the log and refrigerate until thoroughly chilled. When ready to serve, slice log into 1/2 inch slices. These look delicious! I am going to have to make these for sure! These are the Bomb! I have made these numerous times with different stuff mixed in, with plain marshmallows to colored, marchino cherries, chopped nuts. It’s so good. I recommend every one try! Besides it’s easy!! 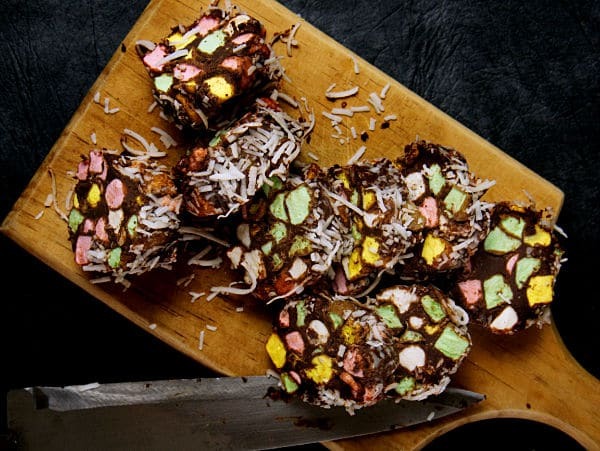 This got to be the easiest treat to make. I like easy recipe. This looks so good! I am going to make this, this weekend. I’m with Tamara on the coconut thing, my kids don’t eat that, but how about some powdered sugar instead? No time like Easter for a giant sugar rush in our house… maybe I can feed them this and then shove my chore list in front of them, and get some work out of the energy! Any suggestions on getting your kids to do their chores daily without constantly nagging them??? I think if you got me the answer to that we could rule the world!!! Truthfully though, thanks for the recipe idea I’d like to try something new. Oooh–powdered sugar. That’s a great idea! Those look yummy, May have to find something instead of the coconut tho my family isn’t fans of it. thank you for sharing. Tamara, you can omit the coconut completely or if you REALLY like nuts, you could substitute finely chopped nuts. Thanks for stopping by! Oh these look so good – I’d eat so many that I would have to earn the 30,000 step badge on my FitBit the next day! Maybe my friends and I can start a step competition after eating a few of these yummy treats. Oh those are so cute!!! 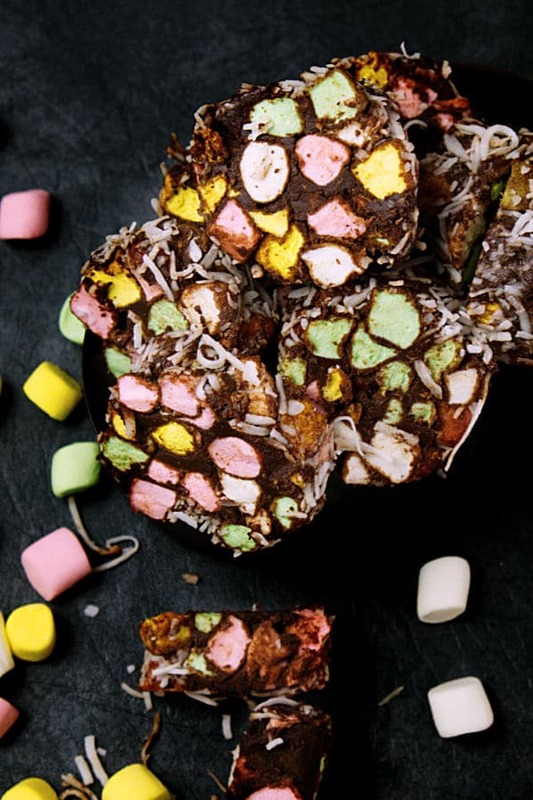 My daughter is in love with marshmallows and would go crazy for these!